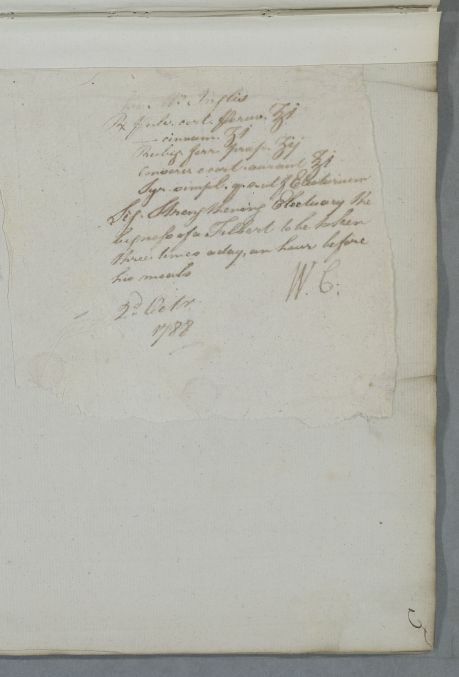 Recipe, 'For Mr. Inglis', for a strengthening electuary. There is insufficient information to identify him with any other patient of the same name. Summary Recipe, 'For Mr. Inglis', for a strengthening electuary. There is insufficient information to identify him with any other patient of the same name. Case of a Mr Inglis who is prescribed a strengthening electuary in October 1788. Take one ounce of Powdered Peruvian bark, one drachm of Powdered cinnamon, two drachms of prepared Rust, one ounce of Conserve of orange peel and a sufficient quantity of simple Syrup to make an Electuary. Label: Strengthening Electuary the bigness of a Filbert to be taken three times a day, an hour before his meals.